If there's one thing I love it's a food that's so good they have to name it twice just to get the point across. That's why I love mahi-mahi. I was able to get a superlative fillet of mahi-mahi (or just mahi to those who don't like to have fun) from my local fishmonger. My idea was to grill it up but I was, once again, lazy and pressed for time. Jen who was all for getting a gas-powered grill for such occasions has since changed her tune so it looks like we'll have to reserve the grilling only for those days where we have more than thirty minutes to prepare dinner. 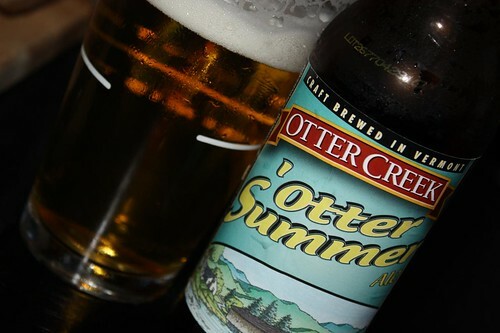 I woke up at 4:00 AM so I was leery of having anything to drink but I started with this 'otter Summer Ale from Otter Creek Brewing. 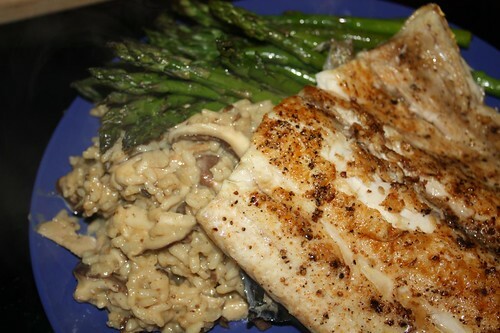 I pan seared the mahi-mahi with a little Old Bay, salt, and pepper. I also steamed some asparagus from Kate & Mike's Naturally Grown in Woodbridge, Connecticut. I also made a sherry shiitake risotto with some more of the shiitake mushrooms from New Jersey. For dessert we watched the Canadiens get thoroughly defeated by the Flyers. This was far sweeter for me than it was for Jen. Normally when we just have some yogurt or ice cream Jen isn't known to shout out so many four-letter words.